Under a nearly cloudless sky, a group of excited Royle Elementary School students looked on last Wednesday morning as adults prepared to dedicate a major addition to their campus -- a colorful new playground set purchased by school parents. The new modern playground at the K-5 school was made possible by $116,000 in funds raised from 120 families this fall by the school's Parent Teacher's Organization to expedite replacing a 1990 playground on the campus that had begun to require more and more upkeep and repairs. The ribbon cutting, timed to coincide with Earth Day, also served to highlight the decision to recycle the school's old playground by donating it to children in Guatemala, officials said. Royle Interim Principal John Grasso said that the new playground is more fitness-oriented than just a set of slides and swings, and includes a balance beam, a rope ladder and other stations that encourage developing upper body strength and better fitness. "This is just amazing and a tribute to the parents who worked very hard to make this happen quickly," Grasso said. "The kids came back from spring break and saw this phenomenal playset all ready to go." 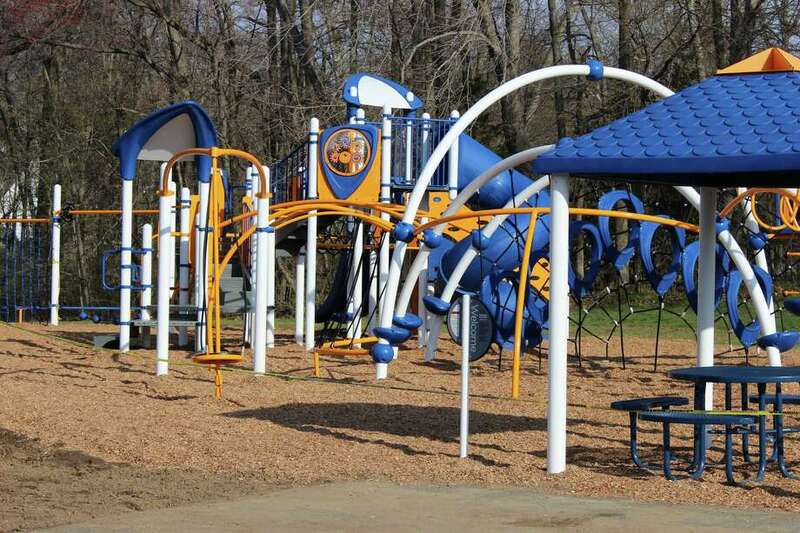 The total cost of the playground was $142,000, with an additional $26,000 contributed by the Royle School's PTO to pay the total cost, Royle PTO President Shelly Skoglund said. This fall, the school district identified $25,000 in repairs that the old playground needed, which prompted the PTO to survey school families about whether they would contribute to replace the older playground. More than 90 percent of families said they would prefer to replace the equipment, Skoglund said. "We didn't think it made sense for the district to spend another $25,000 so this 25-year-old playground could limp along for another few years," Skoglund said. The new playground is made almost completely of powder-coated metal with no wooden parts that can deteriorate, Skoglund said, and was built using a new less costly but still sturdy style of construction that enabled the playground to include more varied activities including climbing and hanging features. "About 70 percent of the value of this playground is in the play features and not the construction," Skoglund said. "The construction is also very stable and should last between 25 and 30 years." At last Wednesday's ribbon cutting, the school also recognized students who contributed the most to the school's Jump Rope for Heart fund-raiser event, inviting the students who raised the most to jump rope at the playground ribbon cutting ceremony. The school raised $24,000. The three students who raised the most were Ava Stone, who raised $1,172, and Molly and Briggs McGuckin, who raised $1,000 each. Skoglund said the PTOs of Darien schools support programs financially in smaller ways throughout the year, and in the past five years have spent significant funds on the audio visual systems at Royle School. The groups are also allowed to contribute up to $110 a year per child for programming such as field trips or other enrichment opportunities. "There are always opportunities on an annual basis to look at areas of need," Skoglund said. "There is a lot of private funding in Darien schools from families."